How can we conceptualize freedom and resistance in Foucault’s theory of power and subjectification? Karsten Schubert presents the first systematic reconstruction of the social-philosophical debate about freedom in Foucault’s works and a new solution to the problem of freedom: Freedom as the capability to critically reflect on one’s own subjectification – in short: freedom as critique – is the result of free subjectification through political institutions. 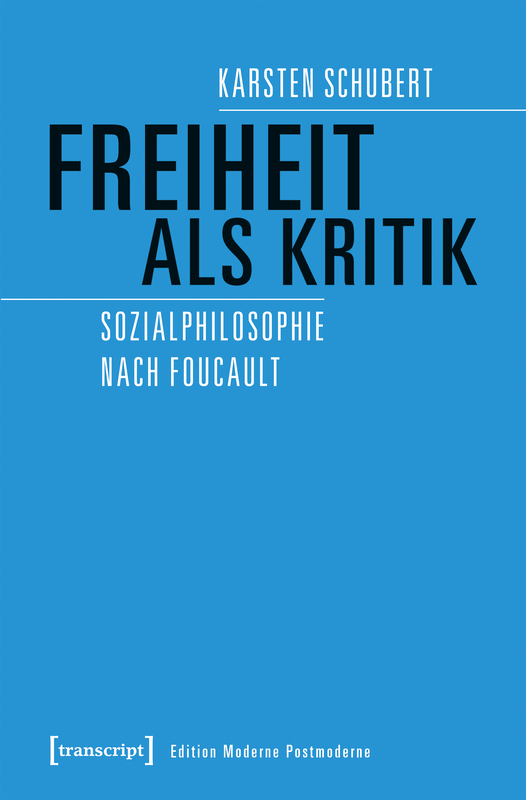 The book thereby shows the consequences for Foucault’s thinking of freedom for theories of democracy and the general social-philosophical discussion about freedom. Karsten Schubert (Dr. phil. ), geb. 1985, ist PostDoc-Fellow bei der Bremen International Graduate School of Social Sciences an der Universität Bremen. Er promovierte 2017 in Philosophie an der Universität Leipzig, zuvor war er Visiting Scholar an der Cardozo Law School und der New School for Social Research in New York und lehrte als wissenschaftlicher Mitarbeiter politische Theorie am Institut für Politikwissenschaft der Universität Duisburg-Essen. Seine Forschungsschwerpunkte sind zeitgenössische Sozialphilosophie und politische Theorie, Rechtsphilosophie sowie Queerund Intersektionalitätstheorie.